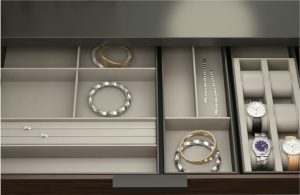 Timeless accessories, able to organize space with elegance. 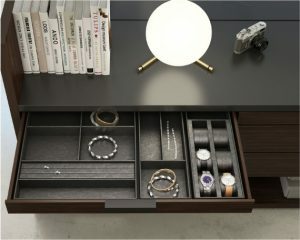 Simple and refined design combines with simil-leather and fabric to furnish prestigious wardrobes, walk in closets and living room furniture. A wide range colours available can be combined to create unique collections of wardrobe accessories, shaped to your design, made with our quality. The delicate touch of Velvet used for internal partition and the smooth tactile feeling of Simil-Leather make harmonious combinations of tactile and visual effects.